Amongst the goodies we're going to be looking at (and currently available in stores across the country, as well as the rest of the world) are the deluxe Dino Charger morpher and the Action Hero 12.5cm (5") Dino Charge Blue Ranger figure. Also included was a promotional Dino Charger, which I'll also talk about a little below, a Power Rangers Dino Charge poster and copy of the latest issue of the Power Rangers Super Megaforce magazine from Panini Magazines (complete with the best free gift of all - a Warstar slingshot). But enough listing - it's time to take a look at these toys and see if this latest range is all charged up or simply a flat battery. First up for discussion is the deluxe Dino Charger morpher! If you aren't familiar with the show or it's Super Sentai counterpart Zyuden Sentai Kyoryuger, the morpher for this series is also their gun. 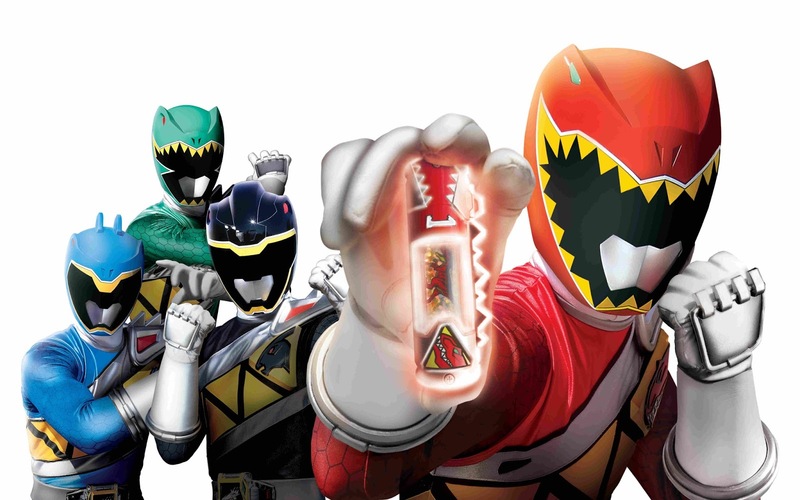 When loaded with the correct Dino Charger, the rangers will morph when fired. The morpher can also be combined with the Dino Saber (sold separately of course) to form a sort of bladed shotgun-like weapon. In both shows the gun is also rather noisy, so if you're a fan of lights and sounds this will already be one to consider. The packaging is pretty eye-catching, with the gun exposed in typical "Try Me!" fashion and the included Dino Chargers just to the side on it. In package the gun has a tag on the bottom that needs to be pulled out before the electronics will work, and due to the way it's bound to the box the opening gimmick can't be tried out until removed. On the back you'll find the typical pictures displaying the toy's functionality, as well as a nice little image of all the Dino Chargers available and how the gun combines with the previously mentioned Saber. So the first thing to address for the Super Sentai fans out there is the differences between the Dino Charge Morpher and it's Kyoryuger equivalent - the Gaburevolver. As you can see from this comparison picture, there are a few notable differences in size, mould and paint applications. The Dino Charge morpher is smaller than it's Japanese counterpart, lacking in some of the paint apps (although the moulding is all there should any customisers want to have a go at it) and features slightly different moulding - specifically in the barrel and trigger areas. The trigger is just a button rather than having a loop around it, and the barrels are moulded in solid orange - most likely due to the stricter toy gun laws we have here in the West. But while admittedly its smaller and not show accurate like the Kyoryuger version, the toy still boasts great moulding and paint apps in its own right. Despite the smaller size it still feels like a decently sized weapon, so it isn't like buying one of the role-play swords only to discover it's not much larger than a butter knife. In a child's hands its probably the perfect size, but in my own I don't feel like I'm holding something woefully small. The on/off switch can be found on the side of the handle, and when switched on the gun makes a stereotypical laser sound. The clear plastic cylinder rolls freely, making a rather satisfying rattling noise when done so. To open the mouth and expose the Dino Charger compartment, simply press down on the red "tail" at the other end of the gun. To then shut it, simply press back up on said tail. If the power is one when you do so, the gun will make a noise each time the jaws open and close. However I'll talk a little more about the electronics a bit further down. Included with the morpher are two Dino Chargers, which are compatible with some of the other Dino Charge role-play toys available and pretty nifty in their own right. These small batteries have a button at the top, which when pressed will cycle through images of that Charger's dinosaur in various charged states - four in total. Being arguably the "main" role-play toy in the line, it should come as no surprise that the Red Ranger's Tyrannosaurus Dino Charger is one of the ones included in this set. Also included is the Black Ranger's Parasaurolophus Dino Charger, which is also numbered two (including the first two with this is a genius way to prompt the start of a collection). The Green Ranger's charger is included with the Saber, while the Pink and Blue Rangers' (along with the many other dinosaurs available) have been released through various other means. The front end of each Charger features a QR code, which when scanned using the official Dino Charger mobile app will unlock more content - including the ability to scan your collection and morph into your favourite Ranger. The features two pins - one of which will be in a unique location as these are what trigger the sounds in the morpher itself. Speaking of sounds - let's talk electronics! Without a Dino Charger inserted the gun plays three different sounds when the trigger is pulled - two generic laser blast sounds and the a longer one with what either sounds like a dinosaur roar or some children cheering (given Kyoryuger, technically either is appropriate). When you insert a Charger with the pins facing inward (note: this version can only hold one Charger at a time, unlike the Japanese one which could hold two), a sound will play. When the jaws are then closed the morpher will read which Charger it is. Then you can spin the cylinder to charge it up, and upon pulling the trigger the morpher will "Unleash the Power" and announce the Ranger's colour (if appropriate). I've never been a huge collector of role-play toys (in fact the Gokaiger Legend Mobirates is the only other one in my collection), so I previously I probably wouldn't have considered getting the Dino Charge morpher. This would have been a big mistake. Collectors may lament the downsize and inaccuracies compared to the Japanese version, but considering the price difference between them this version really delivers. The Chargers are incredibly addictive to just hold in your hand and press, and while I haven't felt the urge to learn the Kyoryuger dance yet I am constantly running the gun down my arm in the hopes that armour will suddenly appear. Accuracies might have been sacrificed, but fun certainly wasn't - the deluxe Dino Charge morpher is a really fun toy that both kids and adult collectors alike will have fun with. As an additional bonus for this review, Bandai UK were also kind enough to throw in a special version of the Tyrannosaurus Dino Charger. While it unlocks the same sounds as the standard version included with the morpher, the outer case is moulded in black rather than the standard grey/silver plastic. Though not accurate, I have to say that I think I prefer this version. It also shows off the horribly addictive nature of the Dino Chargers - not only are there multiple dinosaurs to collect, but also multiple versions of each Charger to look out for. Next up is the 12.5cm (5") Dino Charge Blue Ranger action figure! I'm going to go out on a limb and assume that Bandai sent out a randomly selected figure to each blogger doing this, but I'm over the moon to have gotten then Blue Ranger because Koda is definitely my favourite character on the show (and if you aren't following Yoshi Surdarso on Twitter, you really should be). The figure comes in pretty standard blister packaging, but the card back is definitely nice and vibrant. The back features a picture of the character and a short bio about them, as well as rundown of various things like name, which Power Rangers team they're a part of, individual weapon and zord. The first thing that needs establishing is that these are not on the level of S.H. Figuarts, nor will they never be and are not intended to either. Whereas Figuarts are aimed at adult collectors and feature small, intricate and often breakable parts, the Dino Charge line are TOYS first and foremost. They're designed to be able to take a beating from a child playing with them, as well as look good as part of a larger collection. Power Rangers toys have been a bit hit and miss over the last few series (not to mention the fluctuating scales), but Dino Charge seems to be getting things in order. Sure there's still the body liberties Bandai are taking with their Power Ranger toys, but admittedly the over-muscular look doesn't actually look too bad here. It's not at all accurate, but for some reason it just works with the suit. The sculpting and paint is all really sharp (despite the back of the sash being unpainted), especially the moulded belt detail which I completely missed at first. Articulation is pretty good for a mainline figure with a low price point. It boast 11 points of articulation - including the neck, shoulders, elbows, hips and knees. Both the gloves and boots have cuts and so are able to swivel around to your chosen position. The Blue Ranger (and all of the other four rangers for that matter) comes with two accessories - the Dino Charge morpher and the Dino Saber. The positives are that both these weapons are VERY nicely sculpted for their size, and the morpher can even peg onto the side of the belt! While not show accurate, I do like how it makes the suit feel a little more "traditional" in a sense. The negative is that unfortunately both pieces are moulded in a pretty disgusting lime green colour. Now I fully expect these to be moulded in one colour - colouring them accurately just wouldn't be feasible at this price, but would yellow have been so hard to use? It feels like a minor gripe, but I could see it as the kind of thing that may deter collectors away from these otherwise rather likeable figures. As I said earlier, the 12.5cm/5" Dino Charge line is never going to replace the Kyoryuger Figuarts in the eyes of collectors. But then, the Dino Charge figures weren't released as web exclusives 2-packs which are now reaching a pretty high price on the aftermarket. So while these figures aren't the perfect replacement for your potentially unobtainable Japanese collector figures, they are a pretty fun alternative. The fact Bandai have now chosen a set scale means these will go nicely with the Super Megaforce figures (a line which also included plenty of veteran Power Rangers), and with the line also included plenty of villain characters for the first time in years it also offers an incredible amount of variety. Best advice I can give is that even if these kind of figures aren't usually your thing, pick one up and give it a chance.